Asus Transformer Prime is live on Best Buy, only costs $499! 3 days ago I told you that Asus is taking pre-order for their quad-core Android tablet, Transformer Prime in US and Canada. Now Best Buy also joins in the seller list. 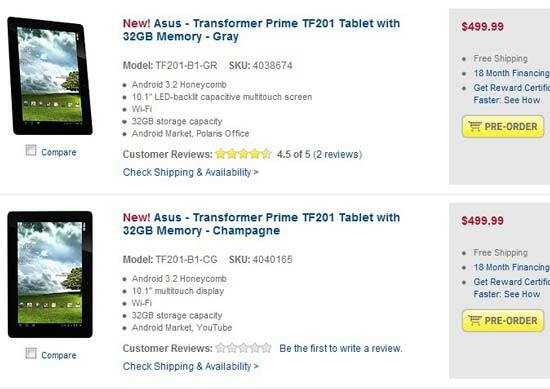 They are taking pre-orders for Transformer Prime for $499 for the 32GB model. They are now offering it on both gray and champagne color. Asus Transformer Prime can be a great choice for you for the upcoming Christmas. It has a 10.1 inch 1280×800 display, Android 3.2 Honeycomb, NVIDIA’s quad-core Tegra 3 processor, 1GB of RAM and a lot more. And surely you will receive Android 4.0 Ice Cream Sandwich update in future. So check the best buy link to see how you can get your first quad-core mobile device into your hand.